Triple Dragon Fortune will whisk you away to an ancient Asian land where you will be engulfed in a breathtaking landscape with an impressive Asian temple in the background set upon a mountainside with towering blue misty mountains behind it and a glowing amber sunset. Sound idyllic? So will you winnings and as the games name suggests there is triple the fun to be had in this orientally inspired 3D slots in the UK. As well as the serene backdrop to the game, the reels are also lit up with colourful symbols that are in keeping with the oriental theme and will hopefully bring you good look and prosperity if you play your cards right. What are you waiting for? Get ready for triple the fun and triple the fortunes with this enticing slot game. 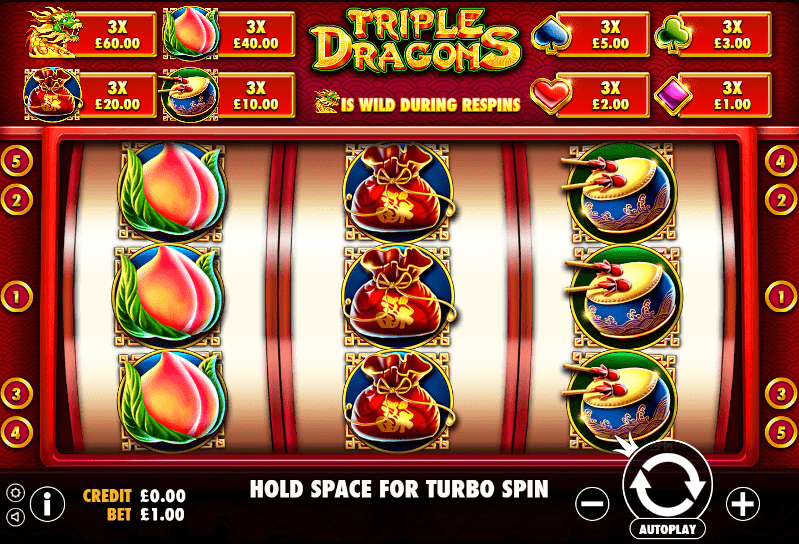 Triple Dragon Fortunes comprises 5 reels and is played across 50 pay lines and houses a total of 13 symbols. As with most spin to win slot games, the aim of the game is to match three symbols to make a winning combination on the same pay line which will trigger a win. Keep your eyes peeled for the higher paying symbols, they won’t be hard to spot, with one of the highest paying symbols being a colourful and prestigious looking peacock and another a black, regal panther. The usual suspects are also present on the reels such as the playing cards, which typically are the lower playing symbols. Read more from our guide about top slots to play today. The game has bonus symbols to help you along the way, with a stunning Wild symbol which is a white glistening pearl and will only land on a limited number of reels: 2, 3, 4 and 5. The Wild symbols will substitute all other symbols apart from the scatter symbols, which is a golden ingot. The scatter is limited to reels 1, 2 and 3 and will multiply your winnings. Additionally, the game has bonus feature round to help keep you on your toes and keep the game entertaining, so if you are lucky enough to land three golden ingots on the reels you will be granted 10 free spins. 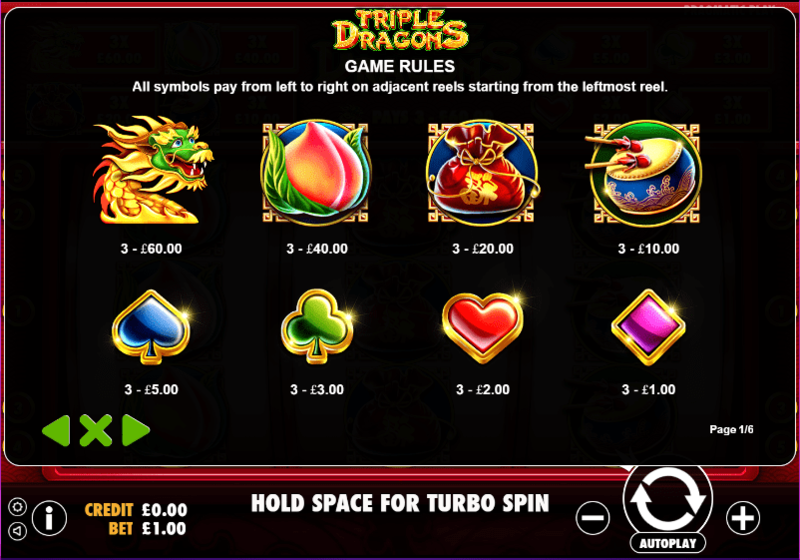 As well as being a visually impressive game to play with an enjoyable theme, Triple Dragon Fortune is a modern and easy to play game, with simple gameplay options, making it a perfects slot game for both beginners and experienced slot game players. The game also has low betting options whilst still offering generous payouts, so that’s another reason why it’s perfect for beginners. There are myriad opportunities to win in this game as there is a high number of pay lines, so the more pay lines you play across the greater your chances of winning big become, making it an interesting game for experienced players with more to play with. If you liked playing Triple Dragons, why not head to 88 Fortunes?